Why do I need a Keyboard Tray Kit? 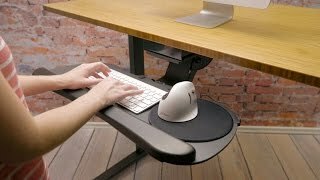 If you work at a corner or L-shape desk, you might enjoy the same freedom to install accessories on your desk that you'd like. You need a corner sleeve to be able to give you the space to install your tray. Then you need a keyboard tray. Luckily, we've combined the best of both worlds in this kit. What keyboard trays will I be able to choose? In our Keyboard Tray Kit, you'll be able to choose from UPLIFT Desk's Large Keyboard Tray or Switch Keyboard Tray. The Large features a single, spacious platform, while the Switch has an ambidextrous mousing platform to task at! How do I know this corner sleeve is sturdy enough to support my keyboard and mouse? You won't have to worry about the strength of our corner sleeve because it's made with reliable steel and powder-coated, so it's sealed for years of hard work. On the UPLIFT Desk Keyboard Tray Kit, you can expect a 5-year warranty on the corner sleeve and keyboard trays, giving you peace of mind that your workstation will remain functional and ergonomic for years of comfortable work. What is the point of using a keyboard tray at my corner desk? We recommend employing this kit if you work at a corner desk and crave a keyboard tray for your workstation. Installing a keyboard tray will allow you to work in a more ergonomically correct positure, which keeps injuries and pain at bay. What else does this kit do? How do I know this will fit my desk? We have two different corner sleeves to choose from depending on your unique desk. Choose our first sleeve, which fits desks up to 1.5 inches thick. Our second corner sleeve fits on desks 1.5 to 2.5 inches thick. Reclaim space on your desktop and type in comfort with the Large Keyboard Tray. With a platform large enough to accommodate a keyboard and mouse, this ambidextrous platform features a removable wrist rest and mouse pad. Flexibility is an important part of any ergonomic workspace. The Switch Keyboard Tray features an independent, ambidextrous mousing platform that complements a compact keyboard tray. Keep your desktop clean and improve your typing position, all with the addition of the budget-friendly E3 Keyboard Tray. The large, subtly curved work surface provides more than enough room for your mouse and keyboard. Adjust the tilt and height with a lever located on the mechanism to find the best ergonomic position for typing. Our Corner Sleeve is available in two sizes to fit desktops between 1'' and 2.5'' thick. Choose the first sleeve to fit desks up to 1.5" thick, or the second sleeve for desks 1.5" to 2.5" thick.